The most wonderful thing has happened. I’ve become a mum. My husband and I celebrated the arrival of our little boy in March. We love him to bits. Amber is the mother of two young boys and author of a very funny blog, www.crappypictures.com, where she shares her stories about the humorous side of parenting, illustrated with (crappy) hand drawn pictures. I first subscribed to this blog long before I ever became pregnant, I was so amused by Amber’s tales of sleepless nights, child logic and endless poo. I often laugh out loud when I read it. If you haven’t encountered Amber’s blog, you can find it here. It’s worth a read and will give you an idea as to what her book is about. 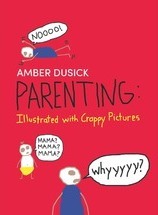 Parenting: Illustrated with Crappy Pictures isn’t a novel but a collection of Amber’s tales of parenting, similar to what you can find on her blog. If you’ve ever spent any time around kids, you’ll appreciate this book. It would make a good gift for a new or seasoned mum. Becoming a parent is definitely an adventure and there are new surprises every day! Congratulations Louise, great to see you posting again too.